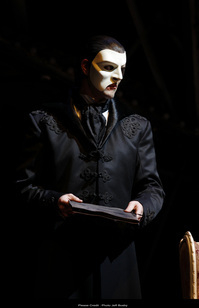 Posted on Mon, Feb 27, 2012 : 5:58 a.m.
Ben Lewis as the Phantom in "Love Never Dies." NCM Fathom and Omniverse Vision will present a fully-staged film production of Andrew Lloyd Webber’s "Love Never Dies," the long awaited continuation to "The Phantom of the Opera," on Tuesday, February 28 and Wednesday, March 7 at 7:30 p.m. Participating local theaters are Quality 16, at 3686 Jackson Road, and Rave Motion Pictures, at 4100 Carpenter Road. Pre-recorded at The Regent Theatre in Melbourne, Australia, "Love Never Dies" features a 21-piece orchestra and an impressive cast of 36 including actors Ben Lewis as the Phantom and Anna O’Byrne as Christine Daae. This exclusive event will include an in-depth interview with Andrew Lloyd Webber as well as behind-the-scenes footage following Lloyd Webber on set as he provides creative direction to the cast and crew of "Love Never Dies." Tickets are available at participating box offices and online at www.FathomEvents.com. For a complete list of theater locations and prices, please visit http://www.fathomevents.com/theatrelist/loveneverdies.pdf?eventid=1066 (theaters and participants may be subject to change). The average ticket price for this event is $18.